Fishing in the Florida Keys? This travel princess? Those were my thoughts when I learned a Florida Keys press visit would include a half-day fishing charter with Captain Skip Bradeen on the Blue Chip Too. When our group of travel writers arrived at Whale Harbor Marina in Islamorada, my misconceptions about offshore fishing were about to be turned on their head. I’m thinking smelly, boring and dirty old fishing boat. I’m thinking, smile, be a good sport and get it over with. Capt. Skip Bradeen has a passion for fishing the Florida Keys. Capt. Skip, who’s chartered over 14,000 fishing trips in his 50 years fishing in the Florida Keys, greets us with the charming brashness of a Long Island native. The born and bred New Yorker, visited the Keys one summer in his youth, never to return home. His passion for fishing the Florida Keys has lasted 72 years and counting. After a short talk that included a safety briefing and familiarization with the boat, Capt. Skip backs the Blue Chip Too from her berth, heading for open water. And about that dirty fishing boat—the Blue Chip Too is anything but. She’s clean and comfortable with plenty of space inside the air-conditioned cabin, a decent bathroom and well equipped for a charter fishing outing in the Florida Keys. Thinking that the closed-in atmosphere of the cabin might induce some seasickness, I climb the ladder to the fresh air of the covered top deck. Taking a seat on a cushioned bench, I watch as Capt. Skip stands behind the boat’s wheel maneuvering the Blue Chip Too through the channel and out to sea. Although the seas are forecasted to be calm, I wear sea bands and take a motion sickness pill for good measure. As the Blue Chip Too travels farther out, the boat rocks when anchored for fishing, which means I need the protection. You may not. As we begin to lose sight of land, Capt. 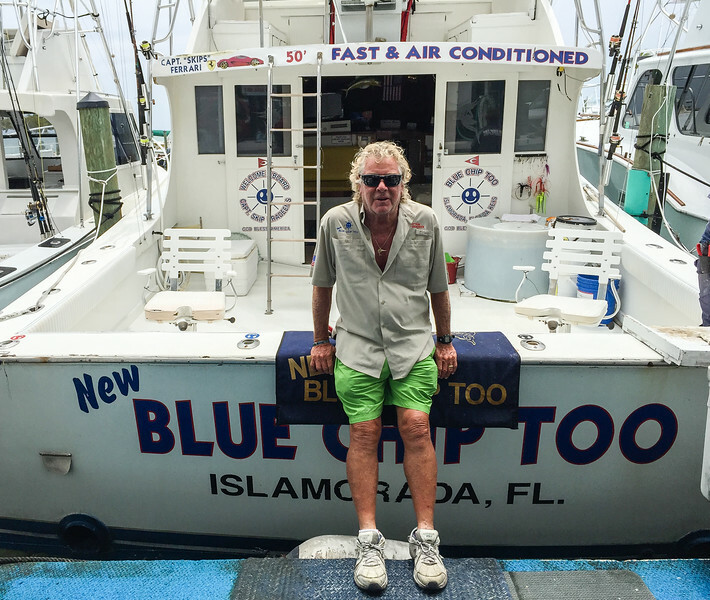 Skip, named one of the 50 top charter boat skippers by Saltwater Sportsman, regales the group with fishing tales of the famous and the not-so-famous fishermen he’s chartered through his years of living in Florida. A scratchy noise emanates from the CB radio. Capt. Skip converses with other boat captains in the area about the afternoon’s prospects. He also turns on a sonar device that indicates a promising area to drop the lines. First Mate, Wayne, anchors the boat, Capt. Skip turns the CD player, loaded with golden oldies, up full blast and the fun begins. Each member of the group takes a turn—there are usually at least 3 of us fishing at the same time—with plenty of instruction from Wayne and the Captain. So far, there’s a lot of casting and re-casting but no fish catching. “Who wants to fish next?” Capt. Skip asks. Thinking that I might as well get this over with, I volunteer. Soon I’m standing at the rail, watching Wayne cast my line into the water. Then he shows me how to slowly reel it out. I take pride in the fact that Wayne says I’m good at reeling out the line. But I am not proud when I snag the line on the bottom. Neither is Capt. Skip. Wayne cuts off the hook and we try again. So far, none of us have had a bite. Where are the fish? And then, there’s a tug on my rod as the slack from the line snaps taught across the water. “You’ve got one,” says Capt. Skip. Wayne, brings over the fighting belt. I place it around my waist, sticking the rod into the holder. “I’ll stand right here in case you need help,” he says. “Do I reel now?” I ask. “No, reel on the way down,” he reminds me yet again. Getting the rhythm of lifting and reeling is proving to be challenging. Ten minutes of lifting, lowering and reeling feels more like an hour. Reeling in a long line from the bottom of the ocean with a fish attached is a heavy process. My arms feel like jelly as muscles strain with fatigue. I can’t imagine doing this without the aid of the fighting belt. Finally my catch appears close to the surface. Wayne stands by with the net, scooping up the fish as I give one final lift on the rod. 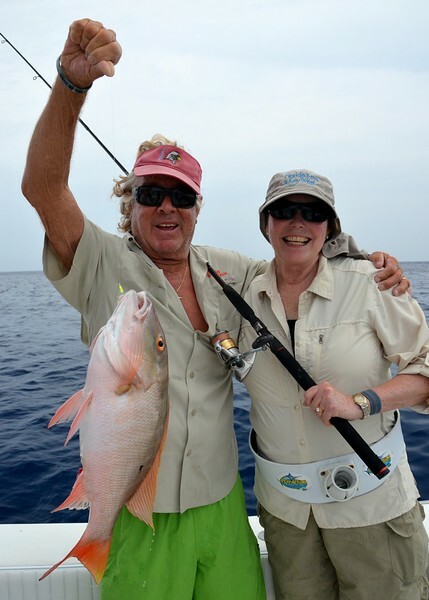 I’ve caught a pink and white-colored beauty, better known as a mutton snapper. Ten pounds of good eating. I caught a big one! Photo courtesy Karin Leperi. “Who’s gonna take the photo?” Capt. Skip demands. “I will.” Karin Leperi offers to snap the shot as Capt. Skip and I pose with my beautiful catch. And the afternoon of fishing in the Florida Keys continues. The music’s blasting, Capt. Skip entertains with his snappy repartee and I’m wearing a big smile. A colorful catch in the Florida Keys. Mine’s the big pink one. Later that afternoon, the Blue Chip Too returns to Whale Harbor Marina. After Capt. Skip and Wayne skin and fillet the fish, we take our catch to Lazy Days Restaurant where the staff prepares it in several different styles. How many ways can you cook a fish? 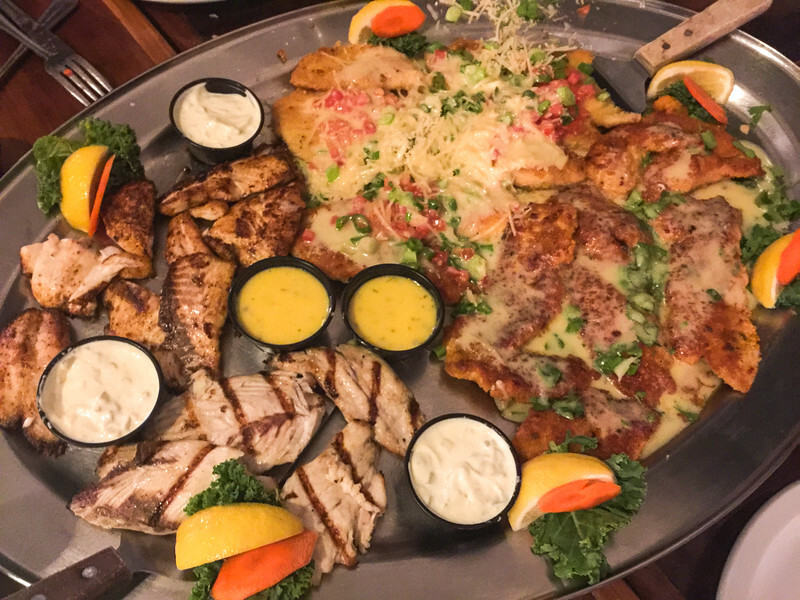 Thanks to Lazy Days Restaurant for cooking our catch. I learned three valuable lessons from my half-day on the water with Capt. Skip—passion is contagious, charter fishing is more fun than I ever thought it could be and the fish that you catch will be the best you’ve ever tasted. 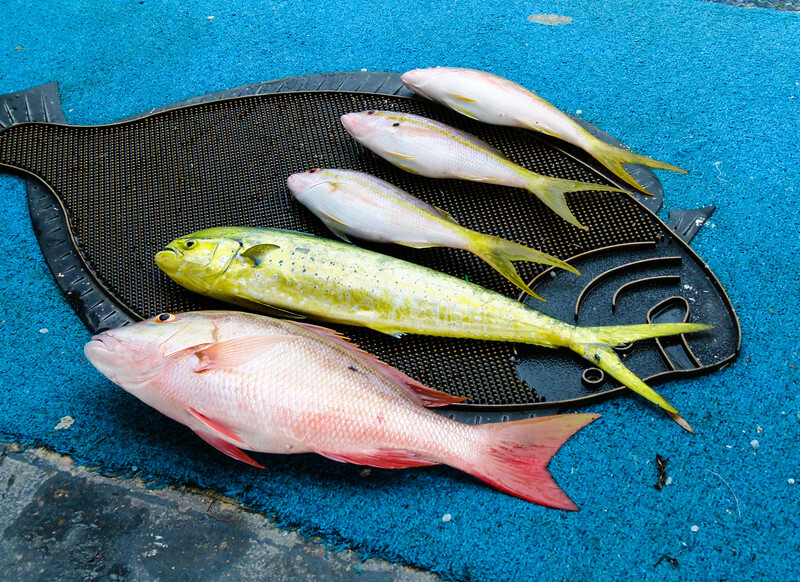 Pack a lunch and bring drinks, you’ll get hungry on a half-day fishing charter. And wear plenty of sunscreen. What did you think of your fishing in the Florida Keys? Join the conversation at the My Itchy Travel Feet page on Facebook or send us an email to ask a question or share your experience. Disclosure: Florida Keys provided this travel experience but the opinions, as always, are my own.